At Cummins Label, we specialize in producing high-quality labels for clients in a range of economic industries, including beer, wine, food, health and beauty, and more. When clients first start working with us, they often wonder the same question: what exactly makes a “high-quality” label? After all, it’s easy enough to print your own labels at home and market your product that way. So, why go through the extra time and resources to print a “professional” label. We want to explain what makes professional labels — and pressure-sensitive labels, in particular — so advantageous for your product as opposed to lower quality labels. 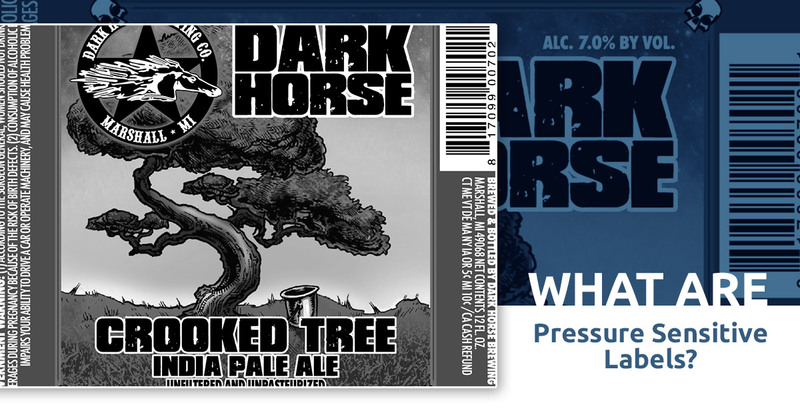 Pressure-sensitive labels (PSL) are an extremely versatile type of label. As such, they represent an incredibly popular labeling method. PSLs are known for their ability to adhere to almost any type and shape of material. If you sell a condiment, for example, you want to make sure that your label can adhere correctly to a more slippery plastic with various grooves. Liner: this is the backing material for your label that acts as a base for your remaining layers. It is thrown away after application. Release coat: this special coating is applied to the top surface of the liner. It allows the actual label and brand art to peel away from the liner and ultimately be applied to the product. Adhesive: PSL adhesives bind the label to the product. Because product shapes and materials differ so drastically, you can customize your adhesive to better fit your product. Face Stock: the face stock is what you see as your final label. It includes the pictures, information, colors, and texture that you choose. Top Coat: a final layer is applied to protect the face stock and give a polished look. We tend to think of labels as merely the face stock — what the customer sees on the product. However, with PSLs, a lot more goes into the production of a high-quality, long-lasting label. This five-layer process explains why custom food labels look a lot better than amateur ones. Why Do I Need a Pressure-Sensitive Label For My Product? Because there are so many reasons to invest in a pressure-sensitive, custom food label, we’re going to write an entirely separate blog on this topic. In general, however, it always goes back to looking professional. Super markets have an average of 40,000 items available to customers at a single store. If your label isn’t high-quality, then consumers assume your product isn’t either. They’ll automatically choose from the thousands of other options they have. To compete for valuable shelf space, it really does take a custom food label. At Cummins Label, we rely on state-of-the-art technology to create custom food labels for our clients. In addition to pressure-sensitive labels, we also feature 10 color flexo printing, screen printing, and digital printing. To professionalize your label and your product, contact Cummins Label today!